Other than holding multiple instruments in their hands at the same time, they also keep track of everything that’s going on in the office and what’s coming next. Their brains are constantly working and rotating through what’s coming next. Their brains are working a mile a minute, but you’d never know it just by looking at them. Dental assistants are great because they are so cheerful. They love their work and it shows! They will chat with you about your day and help you feel more comfortable while in the dental office. Some assistants work in an office with several dentists. They are good at remembering each doctors preferences and can assist each of them easily. They know how to best help each specific dentist. And the dentist appreciates the time they take to customize procedures. It saves them time and stress knowing that everything will be set up just the way they like it. Even a simple procedure has a lot of steps involved. They are great at knowing what needs to happen before, during, and after a procedure. They will have a room and patient all prepped and ready to go and can anticipate the needs of the dentist ahead of time. The dental office is a busy place. Dental assistants are great when they work quickly and effectively. They see a need and will fill it. They are quick on their feet as well as in their mind and are a great asset to any dental procedure. 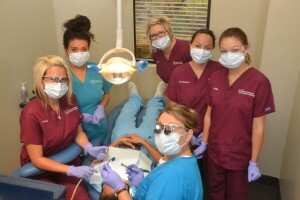 Dental assistants have to go to school and pass some very difficult testing. It takes a lot of knowledge to be successful and they have to know their stuff. They make it look easy, but they had to study and work hard to get where they are.